Today after upgrading Virtualbox on my Arch host I found that I could no longer run Virtualbox. As told I could not boot any of my VMs. After banging my head and reinstalling Virtualbox I found out that the problem is that virtualbox-host-modules package were simple removed. I suspect the dependency became broken when installing either the new arch kernel or the new Virtualbox package. Have you ever forgotten your root password and thought about ways to recover it? It is possible to change it but that also means it’s possible to hack your computer. 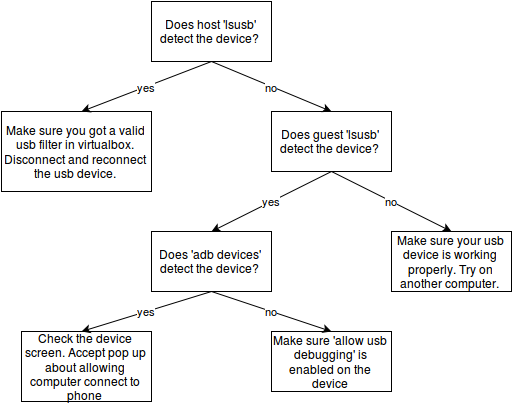 In this post we take a look how to use a live USB and chroot to gain root access. All modern distros comes with a live version, where you don’t need to install the OS but are able to run Linux directly from CD/USB. This is perfect when you need to emergency repair your main OS. However if you are able to boot from another device you can also access the files on any available hd. This can be used to change password on an installed Linux, for good or bad. I was surprised how easy this was to boot up from a live USB and then just use chroot to be able to use passwd to change the and from now on I will make sure to protect my machine better. Is it possilbe to break a VM with the same method? Of course! Let’s get started. First install a guest that you want to break into. See previous post Let’s call it Guest A. In this guide I’ll use Lubuntu* and like for most Ubuntu clones it means there’s no root password, but all we need is a admin password. If you use another distro you probably just want to change the root password. Don’t add any encryption or UEFI support (we talk more about this later). * I found out that Lubuntu got problem to add encryption, so you probably don’t want to use it. A good alternative is Xubuntu. Next we want a Linux live USB. You can skip this step and boot from the Lubuntu CD, our VM will always have a CD drive but some real world machines doesn’t these days so it’s a good exercise to practice with a virtual USB. An option to create a virtual USB is that you use a real USB and add a filter for it under USB settings. Add a new HD to Guest A. Go to Storage and click on the hd with a green plus. Create a 8 Gb drive and check the “solid state drive” and “hot pluggable” check boxes. I have named it liveusb.vdi as seen below. As we can see, sda is for Guest A , sdb is our new hd for the live usb and sro contains the Live CD. Let’s copy the CD to sdb using dd. I know dd is synonym for disk destroy, but that’s why I like VM, the damage is at least restrained to your guest OS. Now let’s boot from the live USB. There’s two ways you can make your system boot from it. You can either mash F12 at VM start up and select the drive. Other wise you can assign the hd to the lowest SATA port number of your hard drives from the storage menu. In the real world boot menu might be locked, but in virtualbox it’s not possible to do so. 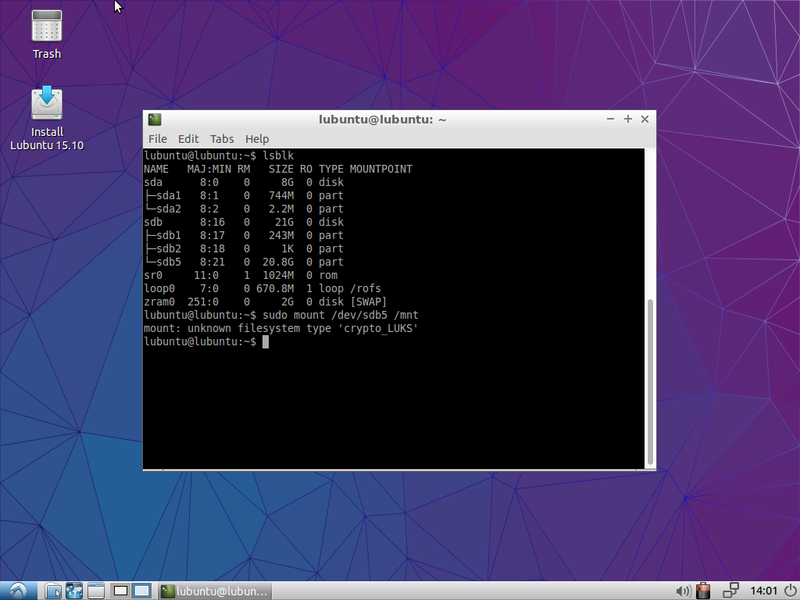 Start the live USB without installing, then open a terminal. Mount Guest A’s root partition to /mnt. In our case you could see that only sda1 can possible be a root partition, sda2 is too small and probably reserved for boot record and sda5 is 4 GB swap. Now you have root privilege in Guest A’s file system. In ubuntu clones you normally don’t have a root user. To find the user name you want to change password for check either /etc/passwd or /etc/group. Let’s open group and see who’s in admin or sudo group. We’re done! Exit from chroot and reboot. Remember to change back the boot order. When Guest A promts to log in, select zabbat as user and 123456 as password. Since you are mounting the file system you can protect it by encrypting your drive. 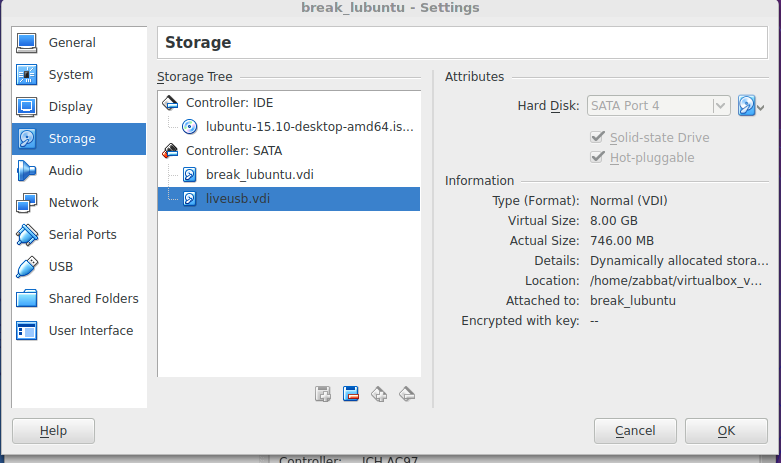 It is not enough to choose “encrypt my home folder” that is a popular choice for ubuntu clones. Your home folder is quite unintresting when it comes to getting your password. Depending on your distro and partition set up it varys what folders you need to encrypt. Don’t take any risk, encrypt everything, since chroot will make it possible to read and edit sensitive files. For an example, one could go to your /etc/passwd and change so that root do not require any password at all. A note, while I was creating an ecrypted installation of Lubuntu I noticed that there’s a bug that stops you from encrypting. I tried Xubuntu instead as seen above and it worked. If some one has physical access to your computer it is incredible easy to hack it. If you have a laptop there really is no excuse for not encrypting your drives, if you loose it without encryption you can assume they break into it. For VM there’s no need to have physical access to the computer. Someone could SSH into the host and break your guest OS. All they need is permission to edit the VM so that it boots from a live CD/USB, or perhaps from the network. Worst case scenario is to not finding the device on neither host or guest. 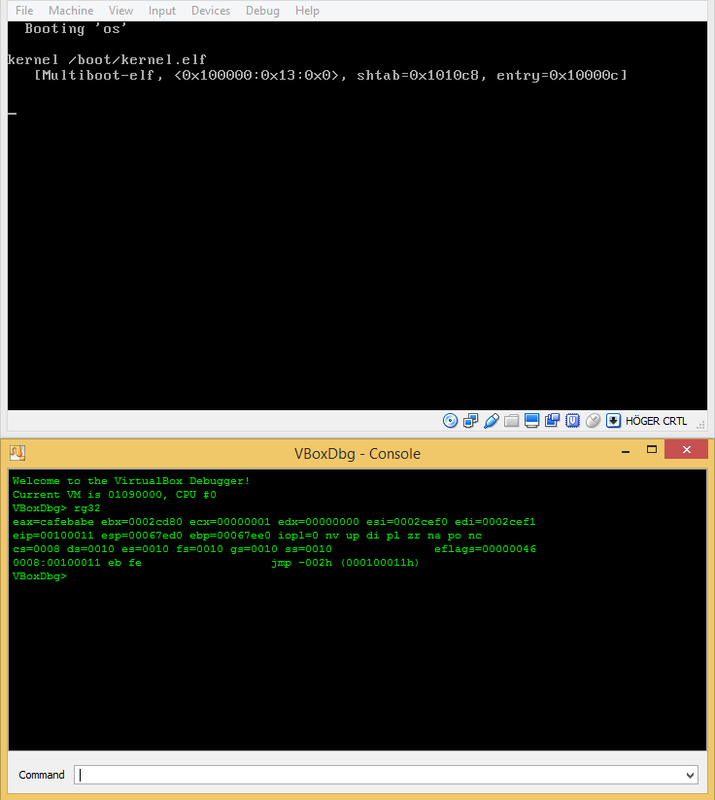 The Debugger for virtualbox is somewhat unknown. There are not a lot of resources online about it and it is not even visible by default. However it is a really powerful tool that makes the sensitive and low level implementation of OS much easier. See my earlier post how to enable the debugger on a windows host. I have followed the code in the little book of OS development and reached chapter 5 about segmentation. Segmentation is a low level task that is best suited for pure assembler which makes it very difficult to know if you did anything wrong. Or more precisely, it is difficult to know what you did wrong, since an error will generate a crash. Logging or printing to the screen will often not help you. The debugger gives you a tool to observe your system from the outside, relatively immune from the crash and with plenty of command to show low level info such as registers and address locations. The first thing to do is to find where in memory interesting code is. Looking for hex pattern is quite difficult. A better option is to look for strings used by the OS. For an example, I have the string “Good bye sir” once the kmain function is done, before the infinity jmp loop (see the OS Development). Searching for a string can be made by sa <range> <pattern>. %%000000000010054a: 47 6f 6f 64 20 62 79 65-20 73 69 72 2e 0a 00 00 Good bye sir…. Usually your code is in the nearby of strings if you have made a small assembler program for booting (but it is certainly not true for larger programs). %000000000010054a: 47 6f 6f 64 20 62 79 65-20 73 69 72 2e 0a 00 00 Good bye sir…. %000000000010056a: ba fe ca bc 04 18 10 00-e8 89 fa ff ff eb fe 00 ……………. %000000000010058a: 08 01 1b 0c 04 04 88 01-00 00 1c 00 00 00 1c 00 ……………. %000000000010059a: 00 00 64 fa ff ff 64 00-00 00 00 41 0e 08 85 02 ..d…d….A…. As you can see, there is the “cafebabe”, a call to where we placed our kernel (“call 000100000h”) and the endless jump loop in the end “jmp -002h”. I’m not sure about the the difference between bp and br. However my system crashed if I try to use bp. I suggest that you try both. Perhaps not a very useful BP since it is in the jmp loop. A problem when debugging is that you often need to set a BP before the OS boots up, because the OS won’t halt and you will miss the code execution point. For a simple OS you can often reuse the same memory address, like 0x100577, and if you followed the OS book then 0x100000 will be the C code entry. The VM will start in a paused state, so add the BP and then resume. Since I want to learn more about Linux Device Driver development I need to learn more how the OS work from scratch. There are many tutorials about the Linux kernel, but they are often too heavy. I need a guide that show me in small steps how to set things up. There is a one great tutorial: The little book about OS development. I am really happy that the authors put up all the effort to write this and publish it for free! It is not Linux but it is still based on the same problems that most OS has to deal with during boot up. I am a big fan of virtualbox so I decided to update the tutorial with how to use it instead of the brosh emulator that is used in the book. You could either develop directly on a Linux host. This will save you time. However I’m on a windows host and I will use a Linux Guest to develop on. If you use Linux as a host you can skip the part about exporting the iso-file. We need to create a guest OS that will run the compiled OS. Let’s call it guest C (as Compiled or CAFEBABE). You can optionally develop from a guest Linux OS. If you are on a host Linux this is not needed. Let’s call this OS guest L.
Don’t create any HD. We will boot from the ISO. Add a shared folder and name it osdev. Enable auto mount. In guest L, add your user to vboxfs group: $adduser $USER vboxfs. Reboot. This is a very simple script. You should probably add some error handling if an iso couldn’t be created. Once you got the iso (if you exported from guest L it will be in osdev folder on your host) you can add it to an optic drive on your C guest. Running it is not very fun, since you can’t see any registers – we need to enable debugging. Restart virtualbox and start guest C.
As you can see there’s a CAFEBABE in eax.